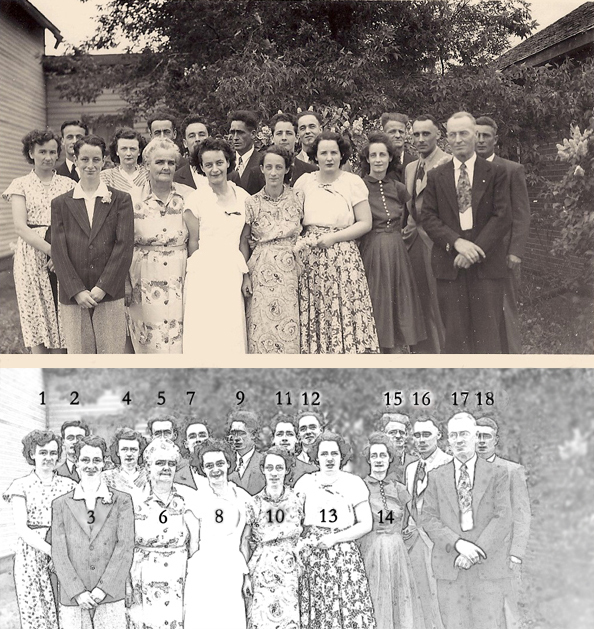 If you are a descendant of this family and have taken a DNA test for genealogical purposes, please consider uploading your results to the free, noncommercial site GEDmatch, and letting me know your kit number (see Contact link in menu above). My own kit numbers are T197393 (from FamilyTree DNA), A843568 (from Ancestry.com), RV8968543 (from 23andMe), and AS4489958 (from LivingDNA). GEDmatch makes it possible to compare your results across the various testing companies, enabling you to find more matches. It is also an indispensable resource for genealogists, helping to make connections where documentary evidence is weak or missing. It will not expose sensitive medical information. The name of the family we treat here is usually found as Heaney, but sometimes as Haney, which is suggestive regarding the nineteenth-century pronunciation. It also appears in a number of transcribed records as “Henry,” which perhaps in some cases reflects a misinterpretation of the name in the original sources. A family record claims that the immigrant couple’s daughter, Catherine (Heaney) Reagan, was born at Dublin. The statement that their daughter Anne (Heaney) Gibney was born at Oldcastle, co. Westmeath, must be treated with caution as an article on her husband published in 1888, when he was apparently still alive, states that he was born in co. Westmeath; and there is no particular reason to believe they were born in the same county, as they were married in Canada. While neither statement has been confirmed, Dublin and Westmeath are not too far apart, and may at least hint at the general vicinity of this family’s origin. However, the 1910 death record of a grandson, John Heaney (son of Patrick), explicitly states that Patrick Heaney was born in co. Mayo, which is on the opposite side of the country altogether. Furthermore, Deborah MacDonald reports a tradition in her branch of the Heaney family which would derive them from co. Armagh, Northern Ireland. There are few parish register extractions for any of these counties in the IGI. Identifying Owen Heaney and his wife Mary Smith in Irish sources would require finding them as a married couple during the relatively brief interval from about 1829 to 1842, predating Griffith’s Valuation of 1847-1864, and most census records. In our Reagan notes, we have referred to the Heaneys as part of a nineteenth-century group-migration from Normanby to Manannah which also included the Gibney and O’Brien families, with whom the Heaneys and Reagans, respectively, were connected by marriage. Other families which made the same move, but for whom no affiliation with the Heaneys or Reagans has been found, include those of Cody and Stewart. Later, in the early twentieth century, the Heaneys, Gibneys and Reagans became part of a second group- or chain-migration to Sturgis, Saskatchewan. Considering the longevity of the associations among these families in the New World, the possibility of connections between them predating their arrival in Canada is one which should be investigated. Most of the members of the first two generations of this Heaney family are buried in the Chapel Hill Roman Catholic Cemetery, Orchardville, on lot 12, concession 1 of Normanby Tp., Grey Co., near the Normanby-Egremont townline. Others were buried a short distance from Normanby Tp. in Holy Cross Roman Catholic Cemetery, Mount Forest, lot 2, concession 11, Arthur Tp., Wellington Co., near the Wellington-Grey county line. A large number of death notices were made available by various contributors, and for so many the name and date of the paper were missing that to avoid tedious recitation of the fact in every case it was decided only to include a source-note when this information was available for citation. Apart from newspaper notices, there appears to be practically no prior literature on this family. A brief pedigree chart by the late Joseph Gerard Heaney (1931-2000) was supplied by his brother, Joseph Frederick Heaney. Jan (O’Brien) Ehresmann (not a Heaney descendant), a kinswoman of the Julia O’Brien who married Patrick Reagan, Jr., son of Catherine (Heaney) Reagan, whose discovery of the Reagans in the 1852 census of Normanby Township, Grey County, Ontario, which finally put us onto the trail of the Heaneys. It was especially generous of her to take the trouble, considering that her own connection to the Heaneys is quite tenuous. She also supplied a complete listing of the Heaneys buried in the Chapel Hill Roman Catholic Cemetery, Orchardville. Deborah MacDonald, a descendant of Owen Heaney Jr.
Rocky Gibney (not a Heaney descendant), who supplied some Gibney material. Tom Synnott (not a Heaney descendant), of Guelph, Ontario, who sent valuable material on the family of his grand-aunt by marriage, Julianna (Heaney) Farrell, and also a large collection of death notices covering many branches of the Heaney family. Marlene (Farrell) Doyle, of Guelph, Ontario, a descendant of James Heaney and Agnes O’Hara. Wendy Lynne (Murray) Pinheiro, who sent information on her family. Joseph Frederick Heaney and his wife Marion, who sent their research notes on their branch of the family as well as records of St. Mary’s Church, Mount Forest, supplied by the parish historian, Bob McIntee. Patrick Hanrahan (not a Heaney descendant), of Portland, Oregon, for information on Margaret Hanrahan, wife of Patrick Owen Heaney. Marsha (Keller) Weaver (not a Heaney descendant), who supplied the photographs of the Gibney family. 1. Owen Heaney (Sr.), of Normanby Tp., Grey Co., Ontario, born probably in 1799, in Ireland, died 5 January 1870, aged at least 69 years, and buried in the Chapel Hill Roman Catholic Cemetery, Orchardville. He married before 1830, presumably in Ireland, Mary Smith, born ca. 1811-12 (aged “41 at next birthday” in 1852, aged 63 in 1871) in Ireland, died 11 April 1887 in Normanby Tp., the age of 78 years given in her death record being probably exaggerated. Her full name is provided in the 1865 marriage record of her daughter Catharine, in the 1866 marriage record of her son Christopher, and in the 1915 death record of her son Patrick. John [Taylor] and his family cleared 200 acres of Crown land which stayed in the family and was owned and operated by his grandson, William Taylor, until the early 1950s. John and Jane had sixteen children, five of whom died in infancy and are buried on the property as there were no cemeteries at that time. Of the eleven living children — six daughters and five sons all married except three sons and settled nearby. Their married children were: Mary (Mrs. Michael Lynch), Betsy (Mrs. Tom MacNamara), Kate (Mrs. Sam Morrison), Agnes (Mrs. Tom Morrison), Annie (Mrs. Bernard MacCauley), Alice (Mrs. John Garvey), Joseph (m. Margaret Currant), John (m. Mary McCann, Guelph, 1888), Patrick, Eugene and Sam remained batchelors [sic] and farmed on the 3rd Con. Mary Agnes Lynch, born 1869-70 (aged 11 in 1881) in Ontario. She married in 1891, William Kenna. The marriage record names both sets of parents in full. John Lynch, born 1871-72 (aged 9 in 1881) in Ontario. Elizabeth Jane Lynch, born 1873-74 (aged 7 in 1881) in Ontario. She married 8 July 1901, to James J. Tone. The marriage record names both sets of parents in full. Johana Lynch, born 1877-78 (aged 3 in 1881) in Ontario. Catherine Lynch, born 17 August 1888 at Ayton, Ontario, died 17 April 1987. She married William Raymond McElhone, born 13 October 1885 in Oxford County, Ontario, died 3 September 1928 at Detroit, Michigan. They had issue. Catherine Taylor, born 16 March 1851 (per 1852 census), living unmarried with her parents in 1871 but not in 1881. As Catherine “Heeney” she served as a witness at the weddings of her younger sisters Agnes (in 1881) and Elizabeth (in 1883). The local history states that she married Sam Morrison. Mary C. McNamara, born 2 September 1886. Elizabeth McNamara, born 16 September 1887. Margaret McNamara, born 16 February 1888. Daniel J. McNamara, born 12 August 1891. Annie (“Nancy”) Taylor, born ca. 1855-56 in Normanby Tp., died 1928, and buried in in the the “St. Paul’s section,” Holy Cross Roman Catholic Cemetery, Mount Forest, Arthur Tp., Wellington Co., almost immediately adjacent to her cousin, Christopher Heaney, son of James Heaney. She was still living unmarried with her parents in 1881, when she is called a servant. She married 9 June 1891 at Normanby, Bernard McAuley, born 1863-64 (aged 27 in 1891; his tombstone gives the date as 1864) in Normanby Tp., died 1950 (? — transcription unclear), and buried with his wife, their surname appearing as “McGauley” on the stone. At the time of their marriage, the record of which names the bride’s parents as John Taylor and Jane Henry (sic) and those of the groom as John McAuley and Catherine Grant, the groom was a yeoman, and both parties were residing in Normanby Tp. ; the witnesses were Joseph Taylor and Johanna Henry (sic), [both] of Normanby. The record is quite mendacious in respect of Annie’s age, passing her off as 26 so as to make her younger than her husband, when she was actually at least seven years his senior. Their tombstone, which mentions no children, is somewhat more honest, giving the date of her birth as 1858. We have not found this couple in the 1901 census. Elward Taylor (also found as Elwood, per Martin Bootsman), born 8 October 1890. James Taylor, born 28 October 1892. Patrick Taylor, born 22 February 1895. Eugene Taylor, born 6 July 1900. Wilfrid Taylor, born after 1900, died 1976, mentioned in the local history as owning and operating the parental farm until his death. Joseph Taylor, born 4 September 1860 (per 1901 census) in Normanby Tp. (per marriage record), still living unmarried with his widowed mother in 1901. He married 29 June 1903 in Grey Co., Maggie Curran, born 1871-72 (aged 31 in 1903) in Normanby Tp., daughter of Edwart Curran and Jennett Burnett. At the time of their marriage, the record of which names both sets of parents, both parties were residing in Normanby Tp., and the groom was a farmer. Agnes Taylor, born ca. 1862-63, not found in her parents’ household in 1881. She married (1) 1 March 1881 at Mount Forest, by Roman Catholic rites, Thomas Morrison, born 1854-55 (aged 26 in 1881) in Ontario, son of James Morrison and Mary Ryan. At the time of their marriage, the record of which names both sets of parents (giving the name of the bride’s mother as Jane “Heeney”), both parties were of Normanby Tp., and the groom was a farmer; the witnesses were Thomas Ryan and Catherine “Heeney,” both of Normanby. She married (2) ____ Simon. She is not known to have had issue buy either marriage. Michael Garvey, born 6 March 1888 (per 1901 census). Ida Jane Garvey, born 13 May 1890 (per 1901 census) at Ayton, Normanby Tp. John Garvey, born 9 August 1892, died 16 August 1892. John Patrick Garvey, born 21 August 21 1893 (per 1901 census) in Normanby Tp. Frederick Eugene Garvey, born 19 January 1897, died 27 April 1897. Ambrose Patrick Garvey, born 12 April 1898 (per 1901 census). Mary Alice Garvey, born 20 August 1903 at Ayton. Margaret Rita Garvey, born 28 February 1911 in Wellington County. Eugene Taylor, born ca. 1874-75, said to have been a bachelor. 2James Heaney, of Normanby Tp., born almost certainly in 1830, and if so then a twin to Jane above. John Heaney, born ca. 1832-33 (aged “20 at next birthday” in 1852), not traced further. 3Anne Heaney, born ca. 1834 in Ireland, reportedly at Oldcastle, co. Meath. 4Patrick Owen Heaney, born about 1836 in Ireland. Catherine Heaney, said to have been born 10 May 1841, in Ireland, perhaps at Dublin, died 11 January 1916, at or near Sturgis, apparently aged 74 years, and buried with her husband in St. Patrick’s Roman Catholic Cemetery, Sturgis, under a monument with the name “O’Reagan.” She married 10 February 1865 in Grey Co., Patrick John Reagan, of Sturgis, Saskatchewan, said to have been born 17 March 1841, the place being given variously as Dublin or as co. Cork, Ireland, died 18 December 1913 at or near Sturgis, and buried in St. Patrick’s Roman Catholic Cemetery. He was a son of Thomas Reagan (Sr.), of Normanby Tp., Grey Co., Ontario, and later of Manannah Tp., Meeker Co., Minnesota, by his first wife, Margaret McEntee. At the time of their marriage both parties were of Normanby Tp. ; the record names both sets of parents in full, but erroneously names the groom’s as “Timothy Regan and Mary McEasten (or McEnter).” Family tradition states that they were living at Mount Forest, Arthur Tp., Wellington Co., Ontario, when their eldest child, Thomas, was born in 1866; but while they may well have been there at an earlier date, U.S. census records show Thomas as having been born in the Minnesota. They moved shortly afterward to Manannah Tp., Meeker Co., Minnesota, where they were enumerated in the censuses of 1870, 1875, 1880, and 1900 (the 1890 census is lost for most of Minnesota). On 10 June 1872 Patrick Reagan was patented the southwest quarter of section 8, in township 121N, 31W of the 5th Principal Meridian, in Meeker County, consisting of 160 acres of land, while the northeast corner went to Bernard Reagan the same day and the southeast quarter to John Reagan a few months later. Patrick and Catherine Reagan attended St. Patrick’s Roman Catholic Church at Eden Valley (which town lies partly in Manannah Tp., on the county line of Stearns and Meeker), and their names are inscribed in one of the stained-glass windows. Patrick Reagan’s lands were the northwest quarter of section 13, in township 34, range 4 of the second meridian west of the Principal Meridian (NW 13-34-4-W2), and the northeast quarter of section 26 in the same township (NE 26-34-4-W2), where he built his homestead. His name is shown on a map of the Sturgis area issued ca. 1907 (?) by the Scandinavian Canadian Land Co. As noted in Harvest of Memories, “the group that came in 1904 were for the most part all living in the same vicinity,” and Patrick Reagan’s children mostly remained close by. A Frank Heaney (whom we cannot identify) appears close by them on the southeast quarter of lot 28. A photograph of his family, probably taken in Canada as it is missing the daughters Anne and Elizabeth, is reproduced in Harvest of Memories, p. 622. For further details of this couple, and their issue, see REAGAN. 5Christopher Heaney (Sr.), born ca. 1842-43, in Canada West (i.e. Ontario). 6Owen Heaney, Jr., born ca. 1845. 7William Heaney, born ca. 1852. 2. James Heaney, of Normanby Tp., son of Owen Heaney and Mary Smith, was born almost certainly in 1830, in Ireland, died 7 June 1917, aged 86 years, 9 months, of arterial sclerosis, and was buried in the Chapel Hill Roman Catholic Cemetery, Orchardville. James Heaney received a Crown grant of 17 in concession 1 of Normanby Tp. on 3 January 1853, but on 29 April 1858, a few months after his marriage, sold it to a member of the Osborn family. He married 14 February 1858 in Grey Co., Agnes O’Hara, born 4 December 1835 (per 1901 census) in Ireland, died 31 December 1911, daughter of Oliver O’Hara and Bridget McRuley. At the time of their marriage, the record of which supplies the first names of both sets of parents, the groom was of Normanby Tp. and the bride of Egremont Tp. As his parents are explicitly called “Owen and Mary Heany” in his marriage record, it is incomprehensible how they came to be called “James Heaney and Mary McCarthy” in his death record (which could not possibly relate to a difference person), except that Owen Heaney died before the birth of James’s son Eugene Heaney, who served as the informant. James Heaney was enumerated in the 1861 census, which gives his family’s religion as Roman Catholic but leaves his religion blank. James “Heany” was a rate-payer in Normanby Tp. in 1864, and a directory published in 1865 lists James “Heany” at lot 22, concession 9 of Normanby, although a descendant, Joe Heaney, states that he was of lot 23. In the 1871 census he is called a farmer and his religion given as Roman Catholic, and similar information is given for him in 1881. Mary Heaney, born 1858 (aged 3 years in 1861) in Ontario, died by 1863, when another daughter was given the same name. Catherine Heaney, born ca. 1860-61 in Ontario, still living unmarried with her parents in 1881, but not longer in their household in 1901. Joe Heaney says she “settled in the United States.” She was probably dead by Jan. 1941, when she is not mentioned among the living sibling in the death notice of her brother, James J. Heaney. Mary Heaney, born 24 October 1962 in Ontario, living unmarried with her parents in 1911. The last surviving member of her family, she was unmarried and of Normanby Tp. at the death of her brother Eugene in 1943. 7James J. Heaney, born probably 10 February 1866, in Normanby Tp. (per marriage record). Agnes Heaney, born ca. 30 April 1868 in Ontario, living with her parents in 1881 but not in 1901. Joe Heaney says she “settled in the United States.” She was probably dead by Jan. 1941, when she is not mentioned among the living sibling in the death notice of her brother, James J. Heaney. Last week it was our sad duty to record the sudden death of Christopher Heaney on April 22nd at his home of the 2nd [concession] of Egremont. The news of his death came as a great shock to his many friends andneighbors as only a few knew of his illness, which was only of five days of pneumonia, followed by heart trouble. The late Mr. Heaney was born in Normanby Tp. in the year 1870, and came to Egremont in 1901, where he made his home ever since. In the year 1904 he married Mary A. McDonald, also of Egremont, who with five children, John, jean, Francis, Margaret, and Joseph, all at home, are left to mourn the loss of an affectionate husband and loving father. He is also survived by two brothers and two sisters: James, Eugene, and Mary of Normanby, and Mrs. Guthrie of Toledo, Ohio [whom we cannot further identify]. He was a good neighbor, always willing to help in time of need. The funeral, which was held on Friday morning, April 25th, to St. Mary’s Church, Mount Forest, was largely attended by friends and acquaintances. Requiem High Mass was celebrated by the Rev. Father Doyle. Interment was made in Holy Cross Cemetery. The pallbeaeres were his neighbors: Messrs. George Fenton, Robert Sim, George Brurows [sic], Albert Moyer, Owen Heaney, and Patrick Heaney. Mrs. Christopher Heaney [was] a highly respected citizen of Egremont township, beloved by all who knew her and a devout member of the Roman Catholic Church. In failing health for some time, she suffered a severe stroke, November 15…. Surviving are [all her children and] … three brothers: Arthur Kennilworth, John, Lion’s Head, and Thomas, Mount Forest, and two sisters, Margaret (Mrs. D. Quirk), Mount Forest, and Sarah (Mrs. John Crowley), North Edmonton, Alta. Two brothers, James and William, predeceased her…. Amongst those attending from a distance were John McDonald and daughter, Lion’s Head, Mr. and Mrs. Herbert Doherty, and Mr. Eric Sharpe, Kitchener. He was born … in Egremont Township, where he resided until his marriage. For the past 25 years he has lived in Normanby Township…. Mr Heaney’s main interest in life was farming up until five years ago when he took sick. The late Mr. Heaney was a member of St. Mary’s Catholic Church in Mount Forest…. The pallbearers were Carman Dickson, Steven Braunstein, Herb Frederick, Peter Vandevelde, Martin Hellier, and George Draper. Mary Jane Heaney (called “Jean” in the death notice of her brother John), born 2 June 1907, died 1973, and buried with her husband in the “St. John’s section,” Holy Cross Cemetery, Mount Forest. She married Luke J. Sullivan, born 1894, died 1968. He spent his entire lifetime in Egremont Township, farming in the Holstein area for a number of years, except for the last four years when he resided in Moount Forest. He attended the Mount Forest St. Mary’s Roman Catholic Church and belonged to the Holy Name Society. Surviving are two sisters, Mrs. Luke (Jean) Sullivan and Mrs. Fred (Margaret) Stortz, both of Mount Forest; two brothers, Joseph of Normanby Township and Joseph of Mount Forest…. Requiem mass was celebrated at St. Mary’s R.C. Church on Staurday morning at 10:30 a.m. Interment was in Holy Cross Cemetery. The pallbearers were James McDonald, Arthur McNeil, Leon Coulson, Matthew Shea, Joseph Heaney of Guelph, and Alex McDonald. 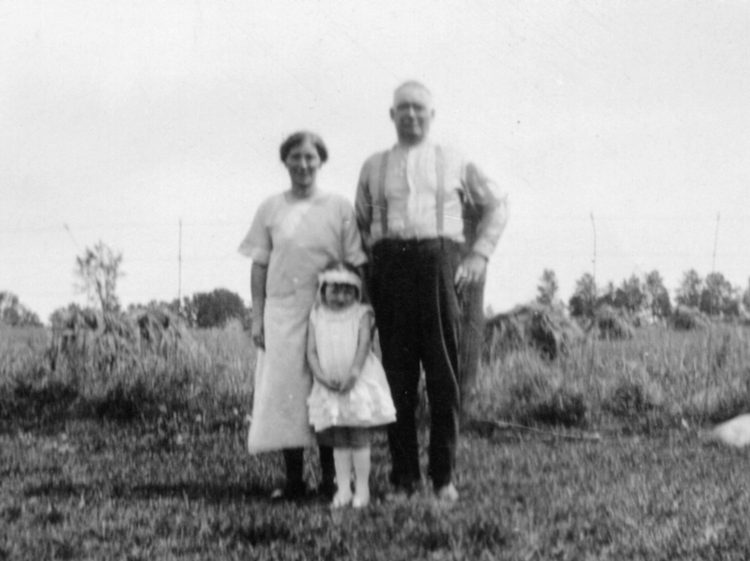 Marguerita Agnes Heaney, born 31 December 1912 at Holstein, Ontario, died 1975, and buried in the “St. John’s section,” Holy Cross Cemetery, Mount Forest. She married 14 June 1944 at Mount Forest, Frederick Ambrose Stortz, born 30 October 1905 in Arthur Tp., Wellington Co., who is mentioned on his wife’s tombstone but was evidently still living at the time it was transcribed in 1983. They had three children. Joseph Heaney, born 1914, mentioned on his parents’ tombstone but evidently still alive when it was transcribed in 1983. He was certainly alive at the death of his brother John on 26 March 1981. Jane Heaney, born 20 October 1872 in Norby Tp., living 1881, but not found with her parents in the 1901 census. She married 14 Feb 1898 in Wellington Co., Charles Keais, born 1871-72 (aged 26 in 1898) in Norby Tp., son of Hugh Keais and Bridget McCarthy. At the time of their marriage, the record of which supplied the full names of both sets of parents, the bride was of Norby Tp., and the groom was a blacksmith, of Mount Forest. She was probably dead by Jan. 1941, when she is not mentioned among the living sibling in the death notice of her brother, James J. Heaney. Mary Hellen Heaney, born 16 August 1904. Oliver Heaney, born 11 November 1878, died young. Elizabeth (“Lizzie”) Heaney, born 1880, died unmarried 1962, and buried in the “St. John’s section” of Mount Forest Holy Cross Cemetery, Mount Forest, Arthur Tp. (although she is also mentioned on the tombstone of a group of siblings in Chapel Hill Roman Catholic Cemetery, Orchardville, in evident anticipation of her being buried with them). She is not found with her parents in the 1901 census, and was probably dead by Jan. 1941, when she is not mentioned among the living sibling in the death notice of her brother, James J. Heaney. Patrick Heaney, born 1882, died 19__, and buried near his brother James. He is not found with his parents in the 1901 census, nor is he mentioned among the living sibling in the death notice of his brother, Christopher Heaney, in 1930. After an illness of about five weeks there passed away at his home in Normanby Township, on Saturday, April 3, Eugene Heaney, in his 69th year. He was born in Normanby, near Ayton, a son of the late Mr. and Mrs. James Heaney, and was well known and highly respected throughout the district. In October 1941, his wife Rebecca Agnes O’Connell passed away. Since then, his sister, Miss Mary Heaney, the only surviving member of the family, has kept house for him. to her the sympathy of the community is extended. The funeral was held on Tuesday morning following Requiem High Mass in St. Mary’s Church, Mount Forest, and interment took place in Chapel Hill Cemetery, Orchardville…. The pall bearers were six nephews, Messrs. Joseph, Frank and John, Leo, William, and Joseph Heaney. It has been stated that Eugene Heaney and his wife had issue, but this seems unlikely in view of the absence of any mention of the fact in his death notice. (according to Martin Bootsman) Julia Heaney. 3. Anne Heaney, daughter of Owen Heaney and Mary Smith, was born ca. 1834 in Ireland, reportedly at Oldcastle, co. Meath (though this may be a confusion with the birthplace of her husband). and died 3 December 1889 at Eden Valley, Minnesota. She married (evidently in extreme youth) 21 September 1848 in Our Lady Immaculate Parish Community, Guelph, Ontario, John Gibney, apparently of Normanby Tp., said to have been born 22 June 1819 (though this is seriously incompatible with the age of 25 years reported for him in the 1861 census) at Oldcastle, co. Westmeath, Ireland, ostensibly still alive when the county history was published in 1888, son of Timothy Gibney and Mary E. Carney (see below). We have not found this couple in the 1852 census, but they are enumerated in the 1861 census of Normanby Tp., in which John is called a farmer, and the family’s religion given as Roman Catholic. A directory published in 1865 lists John Gibney at lot 46, concession 3 of Normanby, the same lot as his brother-in-law John Taylor. Not too long after, probably about 1867 (see below under the account of their son Owen) they removed to Manannah Tp., Meeker Co., Minnesota, where they are enumerated in the 1870 census. According to Reuben L. Gibney, “He [John Gibney] and his family migrated (around 1870) to Eden Valley, Minnesota with a group named ‘The MacKinsie Group,’ because of the discrimination and [poor] treatment by the English residents of the Normandy [i.e. Normanby] area.” At the birth of their son Patrick in 1871 they were at Eden Valley, which town lies partly in Manannah Tp., on the county line of Stearns and Meeker. They were again enumerated in Manannah Tp. in the 1880 census. John Gibney or one of his older sons must have been the “Mr. Gibney, near Manannah, who got from less than half an acre of ground 29¾ bushels of No. 1 wheat,” as reported in the Litchfield News Ledger in a story mentioning record-breaking crops. John Gibney, an enterprising and successful farmer residing on section 27, Manannah township, is one of the most intelligent and one of the best read and posted men in the county, and a man of a great deal of natural as well as acquired ability. He is a self-educated man, but a thorough course of reading on scientific, theological and other subjects has made him a ripe scholar, and because of his attainments he is one of the most prominent citizens in the northern part of the county. Mr. Gibney was born in County West Meath, Ireland, on the 22d of June, 1819, and is a son of Timothy and Mary E. (Carney) Gibney. His early life was spent in the land of his birth, but in 1836 he came to the new world, landing at New York, and settled in the county of Madison, in New York State. In 1838 he removed to Canada, and remained there until 1865, when he came to Meeker county, Minn., and settled in Manannah township, where he has since lived. In 1818 Mr. Gibney was married to Miss Anna Heaney, and their union has been blessed with ten children, five girls and five boys, whose names are as follows — Timothy, Mary, James, Owen, Katie, Ann, Patrick, Christopher and Eliza, all of whom are living. The family are members of the Catholic Church. During twenty-two years of his life, Mr. Gibney followed railroading, but the balance of the time he has been farming. In political matters he is an independent voter, and acts regardless of the dictation of party or creed. He has taken an active interest in his township affairs, and has held several local offices, one of which was that of township assessor. Timothy Gibney … is an enterprising and thorough farmer who resides on section 27, in Manannah township. He was born in Upper Canada on the 22d of November, 1849, and is the son of John and Anna (Heaney) Gibney, his parents being natives of Ireland. His early life was spent in his native Dominion and in 1865 he came with his parents to the United States and they made their way directly to Meeker county, Minn., settling in Manannah township, where they still reside. Timothy has 120 acres of land and has been very successful in his farming operations. In connection with his diversified farming interests, he carries on stock raising in a limited way. The subject of our sketch was married on the 4th of February, 1883, to Miss Mary E. McCaffery, and their marriage has been blessed with three children whose names are James T., Elizabeth, and Patrick, all of whom are still living and at home. Mrs. Gibney’s parents were both natives of Ireland, who came to America at an early day and died in Upper Canada. Both Mr. and Mrs. Gibney are exemplary members and active supporters of the Catholic Church. Mr. Gibney is a Democrat in political matters and has taken an active interest in township affairs, having held various local offices. Timothy Gibney, a nephew of Catherine O’Reagan, went up to Canada (Saskatchewan wasn’t a province yet) and investigated homesteading. The next year the Gibneys, Fitzpatricks and Reagans, all related, sold their farms, and moved up to what is now the Sturgis area to homestead. Two of the Patrick O’ Reagan children, Anne and Elizabeth, with their husbands, remained at Eden Valley. The rest loaded up all their cattle, machinery, and other possessions and took the train to the outpost of Yorkton. The next fifty to sixty miles to their homestead, probably by horses and wagon, was a nightmare. They came in one of the wet cycles where every low spot was full of water. Black flies and mosquitoes were everywhere. The bridge over the Whitesand River had gone out. Story has it that Earl Laing helped them out by taking eighteen loads of furniture and belongings across the river in his boat. In all, they were about seventeen to eighteen days trying to get to their new land. The Reagan clan lived in sod houses for the first few years, probably on the quarter of land Patrick bought in 1903…. Patrick began working his homestead quarter [NE 26-34-4-W2] and by 1909 he had sixty-seven acres broke and in crop. He had proved up his homestead amd received his patent on October 28, 1905. He built a 25×18 foot lumber house as well as some out-buildings. He and his family moved in April 1907. His family is found at 12-34-4-W2 in the 1906 census, surrounded by the families of several of his sons. They are also found there in the 1911 census. 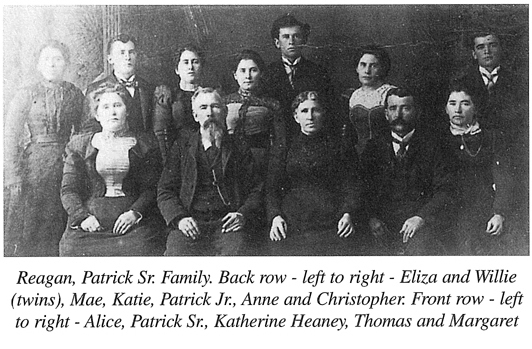 One of his children by his second wife was Charles Hugh Gibney, who married our kinswoman Honora Healy (see group photograph below); and among this couple’s thirteen children were the Rev. Charles Gibney (1924-1992), a Catholic priest. Sarah FitzPatrick, born 1877-78 (aged 2 in 1880) in Manannah Township. Patrick FitzPatrick, born in February 1880 in Manannah Township, died 15 July 1970 in the General Hospital, Flin Flon, Manitoba. He married in 1911, Anna Reagan, born 27 March 1886 in Manannah Township, and died 11 November 1922, apparently at Sturgis, Saskatchewan, daughter of Mitchell Reagan and Hannah Ryan, granddaughter of John and Selina/Sylvia (____) Reagan, and great-granddaughter of Thomas Reagan and Margaret McEntee, of Normanby Township, Grey County, Ontario, and of Manannah Township, Meeker County, Minnesota, parents of Patrick John Reagan, husband of Catherine Heaney, who figures elsewhere in these notes. They had issue. Joseph Austin FitzPatrick, born 24 January 1886 at Eden Valley, Meeker County, died 14 December 1968 at Aberdeen, Grays Harbor, Washington, where he was buried. He married Helena Therese Steinke, born 1890, died 1967, and had issue. Margaret FitzPatrick, born 29 March 1887 at Eden Valley, Minnesota, died 22 February 1970. She married 14 November 1911 at West Duluth, Minnesota, James Alexander Morrow, died 1956. James FitzPatrick, born in March 1890 in Manannah Township. Owen Gibney (named for his maternal grandfather), born 26 December 1858 in Ontario, died 1951, and buried in the churchyard of Our Lady of Manannah. He married 2 April 1888, Mary Cassady/Cassidy, born 10 September 1866 [?] in Canada, of Irish-born parents, died 1927, and buried with her husband. According to the 1900 census of Manannah, which calls him a farmer, he came to the U.S. in 1867, she in 1883, and they had six children, of whom five were then living. The 1910 census of Manannah states that Mary had borne seven children, of whom only four were still alive; living with them at the time was Mary’s sister, Ellen Cassady. The 1920 census of Mananah states that Owen Gibney was naturalized in 1866, and gives his occupation as farmer. Owen Gibney, residing on section 15 of Manana township, is one of the prosperous and highly esteemed farmers of Meeker county. Mr. Gibney was born in Canada, December 26, 1858. His parents, John and Anna (Heaney) Gibney, were natives of Ireland. Our subject came to Minnesota with his parents when he was six years of age, and the family settled in Meeker county. He attended the common schools and worked with his father until he was twenty-four years of age, when he bought a farm on section 15 of Manana township. He now owns eighty acres of land, all of which he has under cultivation, and the farm yields a good income. He has a good seven-room house on the place and two log barns and has placed valuable improvements on the farm. He has all machinery necessary and keeps considerable stock, and follows general farming successfully. Mr. Gibney was married April 2, 1888, to Mary Cassidy, who was born in Canada, September 10, 1868. To Mr. and Mrs. Gibney five children have been born, namely: Johanna, Anna E., Maggie B., Mary E., and Sarah J. Mr. Gibney is a member of the Modern Woodmen of America and the Catholic church. The statement that Owen Gibney was six when he came to the U.S. implies a date of about 1864, which is not in accord with that cited above which places his move in 1867; and some liberty appears to have been taken in the statement of his wife’s birthdate, which was probably a few years earlier than given here. Johannah Gibney, born February 1889 in Minnesota, living unmarried with her parents in 1910 but no longer living with them in 1920. Anna E. Gibney, born October 1890 in Minnesota, died ____, and buried at Our Lady of Manannah, sharing a tombstone with her younger sister, Agnes Gibney. She was living unmarried with her parents in 1910 but no longer living with them in 1920. She married ____ Borman, who we have not identified. From various evidence, her husband was pretty clearly not the Clement H[erman?] Borman (1893-1983) buried in the same cemetery. Willie Gibney, died in infancy 11 November 1893, and buried at Our Lady of Manannah, sharing a tombstone with his younger brother Johnny. Maggie Blanche Gibney, born probably in July 1893 in Minnesota, still living unmarried with her parents in 1920, when she was a public-school teacher. Mary E. Gibney, born in July 1895, called “May” in the 1913/14 directory and in the 1920 census; still living unmarried with her parents in 1920, when she was a public-school teacher. Sarah Jane Gibney, born in Jan. 1897, died 26 May 1905, and buried at Our Lady of Manannah. Willie Gibney, died in infancy 11 February 1901, and buried at Our Lady of Manannah, sharing a tombstone with his elder brother Willie. John Gibney, born 1910-11 (aged 9 in 1920) in Minnesota. Agnes Gibney, born 1912-13 (aged 7 in 1920) in Minnesota, died (unmarried) 1931, and buried with her sister, Ann (Gibney) Borman. Jane Gibney, born 1858-59 in Ontario (aged 12 in 1871, 21 in 1880). She initially remained in Ontario when her parents went to Minnesota, and in 1871 is found as a 12-year-old girl in the household of her uncle, Owen Heaney, Jr. However, she is found in her parents’ household at Manannah in the 1880 census, in which she is called a “laborer on farm.” she married 20 June 1889, Daniel Hawkins. Anna Mulvihill, born 1894 at Minot, Ward County, North Dakota, died in 1988 at Spokane, Washington; married Joseph A. O’Neill, born in 1892 in Iowa, died in 1965 at Spokane. They had six children, including a daughter, JoAnn O’Neill. Elizabeth “Beth” Mulvihill, born 1896 in Noth Dakora, died 1992 at Burlington, Skagit County, Washington, U.S.A.; married Parley W. Connell, born 1889 in Utah. They had at least one child, a daughter who married Arthur Halbert Silvernail. Ann Gibney, born 25 October 1864 in Minnesota. She is said to have married ____ McDonagh. James Gibney, born ca. 1867 in Minnesota. Laurence W. Gibney, born in July 1896 in North Dakota (per 1900 census). Reuben Leo Gibney, Jr., born about April 1919 (aged 1 year, 2 months at the taking of the census on 22 June 1920). Arcelia M. Gibney, born 1 May 1927 at Santa Rita, Grant Co., New Mexico, died 12 September 1969 at Santa Ana, Orange Co., California, aged 42 years. She married George P. Carter. We take most of our information on her from the webpage of R. Gibney. Christopher Gibney, born ca. 1874 in Meeker Co., died 1934 at Long Beach, California. Mary Lundy, born 1902-03 (aged 17 in 1920) in North Dakota, still living unmarried with her parents in 1920. Annie Lundy, born 1905-06 (aged 14 in 1920) in North Dakota. Catherine Lundy, born 1908-09 (aged 11 in 1920) in Minnesota. Archie Lundy, born about September 1911 (aged 8 years and 4 months a the taking of the census on 10 January 1920, 18 years in 1930) in Minnesota (per 1920 census) or in North Dakota (per 1930 census), who as noted above was living with his maternal uncle, Patrick Gibney, in Grant Co., New Mexico, in 1930. We have not identified him in earlier census records. Joseph Lundy, born about October 1918 (aged 1 year and 3 months at the taking of the census in 10 January 1920) in Washington State. 4. Patrick Owen Heaney, son of Owen Heaney and Mary Smith, was born about 1836 in Ireland, perhaps in co. Mayo as stated in the death record of his son John, died 9 March 1915 in Normanby Tp., Grey Co., of old age, and was buried in St. Peter’s Roman Catholic Cemetery, Ayton. He is not found with this family in the 1852 census, but a directory published in 1865 lists “Patrick Heany” at lot 23, concession 9 of Normanby, immediately adjacent to James Heaney. He married 26 January 1862, Margaret Hanrahan, born around 1839 in Ireland, possibly in co. Tipperary as stated in the death record of her son John, died 27 September 1911 in Normanby Tp., of “nuristhemia” (neurasthenia) and heart failure, daughter of John Hanrahan (who is named in her death record), by the latter’s wife Mary O’Brien. Her maiden name is given as Hanahan in the 1896 marriage record of their daughter Mary Anne and as Hannahan in the 1930 death record of their son John. The spellings “Hamaker” in her own death record and “Hamsharn” in a published transcription of the 1905 marriage record of their son John are certainly mistakes. Mary Heaney, born 24 January 1864, died young, presumably by 1870 when another daughter was named Mary Ann. Owen Eugene Heaney, born 5 November 1866 (per 1901 census), alive in 1923; called Eugene in 1871 but Owen in 1881 and 1901. He was still living unmarried with his parents in 1901. As documented below, he is named as Owen Heaney, of Ayton, Ontario, uncle of Vincent Corcoran, in April 1923. Johanna Heaney, born 28 March 1868, died 1948, and buried with her husband in Chapel Hill Roman Catholic Cemetery. She was still living unmarried with her parents in 1901. She subsequently married 11 February 1918, John Smith, born perhaps 1857 or 1867 [? ], died ____. Considering that she was aged nearly 50 at her marriage, it seems unlikely she can have had children. A Mary Kelly (1886-1960), otherwise unidentified, is buried with her and her husband. Mary Margaret Corcoran, born 13 May 1897 in Wellington Co. Not found with her parents in the 1930 census. Mary A. Corcoran, born about October 1926 (aged 3 6/12 in April 1930) in Michigan. Patricia A. Corcoran, born about June 1928 (aged 1 10/12 in April 1930) in Michigan. Vincent E./J. Corcoran (called Vincent E. Corcoran in the 1930 census), born about March 1900 (no birth registration found) at Mount Forest, Grey Co., Ontario. He served as a witness at the 1923 wedding of his older brother Thomas. This is probably the explanation for his crossing the U.S. border at Detroit on 4 April 1923; the record names him as Vincent J. (sic) Corcoran, of Detroit, auto mechanic, aged 23 years and 1 month, born at Mt. (sic) Forest, son of Joseph M. Corcoran, and his nearest relative (in Canada) as his uncle Owen Heaney, of Ayton, Ontario. He was still living unmarried with his parents in 1930, when he was a bus driver. Francis Harold Corcoran (called Harold F. Corcoran in the 1930 census), born 11 October 1901 in Wellington Co., living unmarried with his parents in 1930, when he was a postal clerk. James Leonard Corcoran, born 9 December 1902 in Wellington Co. Not found with his parents in the 1930 census. John Ignatius Corcoran, born 22 July 1906 (no county stated in record). Not found with his parents in the 1930 census. Gladys G. Corcoran, born 1909-10 (no birth registration found; aged 20 in 1930) in Ontario; living unmarried with her parents in 1930. John Heaney, born 11 June 1873 on lot 23, concession 10 of Normanby Tp. (per his death record), died 10 June 1930 in Normanby Tp., of a paralytic stroke, aged 57 years less one day, and buried in St. Peter’s Cemetery, Ayton, Ontario. He married 22 February 1905 at Ayton, Normanby Tp., Grey Co., Ellen Horrigan, born 1868-69 (aged 36 in 1905) in Normanby Tp., daughter of Denis Horrigan and Honora O’Sullivan. At the time of their marriage, the record of which supplies the full names of both sets of parents, both parties were of Normanby Tp., and the groom was a farmer; the witnesses were Owen Heaney of Orchard Tp. and Johanna Heaney of Ayton Tp. In his death record, John Heaney is called a farmer, of lot 23, concession 7, Normanby Tp. No children have been identified. Margaret Heaney, born 20 June 1874, died (apparently unmarried) 18 November 1912, aged 28 years, and buried with her parents. She was living unmarried with her parents in 1901. James Patrick Heaney, born 5 March 1876 still living unmarried with his parents in 1901. William Heaney, born 5 June 1878, died (apparently unmarried) 18 March 1910, aged 27 years, and buried with his parents. He was living unmarried with his parents in 1901. Catherine Heaney, born 26 August 1880. MINNESOTA PIONEER DIES AT EIGHTY YEARS OF AGE. William Heaney, assistant jailer at police headquarters, received word Thursday night of the death of his father, Chris Heaney, in Meeker county, Minn. Chris Heaney, who was 80 years old [a wild exaggeration], settled in Minnesota before the civil war. James and Owen Heaney and Mrs. John Lovett, Mrs. Feeney and Mrs. James Silk, all of Butte, are children of Chris Heaney. One unusual incident connected with the death was that Chris Heaney, a few hours before he died, read a telegram from Ontario telling of the death of his brother [Owen?] that same day. Mary Ann Heaney, born 13 February 1867 in Ontario, died 1918. She married 2 April 1888 in Meeker County, Thomas Regan, born 1861-62 in Canada West, son of Bryan/Bernard Reagan and Mary ____. They had issue. Owen H. Heaney (III), born ca. 1869 in Minnesota. Catherine Heaney, born February 1872 in Minnesota, died 1940. She married by 1900 (when they are enumerated in the census of Manannah Township), John Lovett, born in October 1857 in Canada. Jane (“Jennie”) Heaney, born ca. 1873 in Minnesota, died 1924. James Heaney, born ca. 1877-78 in Minnesota, died 1940. William George Heaney, born September 1879 in Minnesota, died 1918. Christopher Heaney, Jr., born May 1882 in Minnesota, died 1904. In 1900 he is listed as a “brother-in-law” in the household of John Lovett. Agnes Heaney, born 1884, died 1963. Frank P. Heaney, born 1885, died 1962. Thomas Heaney, born 1887, died same year. After the death of her husband in January 1911 … Mrs. Bertha Heaney decided it would be best to move west to the Ceylon and Hardy area, where her brothers Oliver, Barney, Arthur, Charles, and a sister Agnes (Mrs. William Reidy) were living. In August of that year she arrived with her four children, Ambrose, Evelyn, Kathleen, and Jack. Mrs. Heaney and family lived with her brother Oliver for a year on the S.E. 14-5-21 W 2nd. She homesteaded the N.W. 6-5-20 W 2nd, but being a widow did not have to live on the land to prove it up. As long as the required number of acres was broken up, title could be obtained. 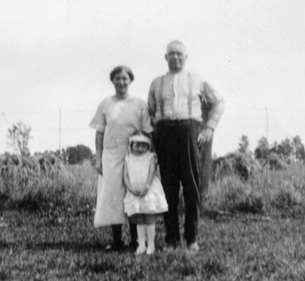 In the summer of 1912, Ambrose and Evleyn lived with their aunt, Mrs. Wm. Reidy, and went to school in Ceylon from their farm, which was four miles from town. 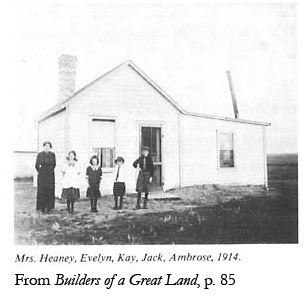 In the fall of 1912, Mrs. Heaney purchased a small house and moved it to town so it would be easier to get the children educated. In 1915 Mrs. Heaney became janitor of the two-room school in Ceylon (the Village Hall), and with the help of Ambrose and Evelyn carried on this work for a few years. … All of the Heaneys were quite active in sports during their school years, and for many years thereafter. … The family all took part in skating, curling, tennis, [and] baseball, with Jack and Ambrose playing hockey with the Ceylon teams for many years. Eveyln and Ambrose were in the Ceylon Band during the late ’teens and early twenties, and Ambrose was in the Ceylon Orchestra at the same time. After an illness of more than a year, borne with true Christian forbearance and patience and after receiving the consolation of the last rites of the Roman Catholic Church, there passed away recently at Ceylon, Sask., a long time and respected resident, Mrs. Bertha Heaney, sister of Mrs. Ellen McNeill, Arthur Tp. Born in Mount Forest on December 11, 1874, the deceased was married to John Heaney, going to live at Sault Ste. Marie where her five children were born. Her husband died in 1911, and that year she went to Hardy, Sask., then to Ceylon, Sask., the next year so as to be close to a school. The esteem in which she and her family are held in Ceylon today is a tribute to her devotion and self-sacrifice. For the next thirty-four years Mrs. Heaney played an active part in the Ceylon community. By her kindness, charity, and patience she earned an enviable place in the hearts of all who came in contact with her. She is survived by two sons, Ambrose of Ceylon and John of Regina, and Kathleen (Mrs. T. Curran), of Ceylon; also three brothers, Oliver, Bernard, and Charles O’Hara; four sisters, Mrs. Wm. 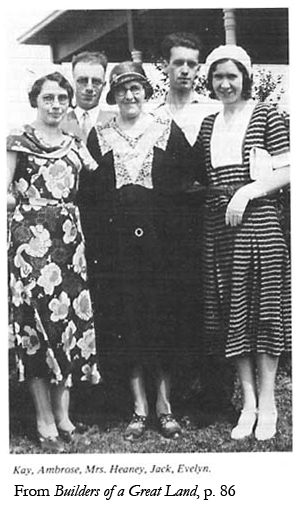 Reidy, Regina; Mrs. Ellen McNeill, Mount Forest; Mrs. Julia O’Donnell, Chicago, and Mrs. Theresa Carraher, Stratford; also four grandchildren. The funeral was held in St. Joseph’s Church, Ceylon, when solemn Requiem Mass was celebrated by Rev. R.J. McKenna. Her only grandson, Gerard Heaney, acted as acolyte. The pall bearers were Messrs. P Reidy, E. Reidy, Martin Shannon, Robert Kines, Harry O’Connell, [and] John Downey. In addition to helping his mother with the school janitor work, Ambrose worked part-time in the Kines store and in the munipal office. In 1917 he joined the Bank of British North America (later amalgamated with the Bank of Montreal) and in addition to spending four years in Ceylon, worked in Weyburn, Regina, Rhein, and Tisdale. After ten years with the bank he returned to Ceylon to become Secretary-Treasurer of the Rural Municipality of the Gap No. 39 and the Village of Ceylon, until December 1968, and supervising Secretary-Treasurer for part of 1969. He was later persuaded to go back … for two years to train a new man … for the job. During 1968 he remodelled the old post office and set up his own full-time insurance and investment business, beginning January 1st, 1969, which he carried on until May, 1977…. He is now  living in retirement with his wife Leah in the same property that he purchased when he came back to Ceylon in 1927. In December 1931 Ambrose married Leah Morrow, a [maternal] niece of Joshua and Robert Kines. Leah worked for a few years in the bank after teaching for a while. They have four children and 14 grandchildren. Marlyn Heaney, married ____ Calibaba, of Radville, and had four children. A. Gerard Heaney, of Ceylon, married in 1966, Bernadette Reidy, and had three children. He receives his own sketch in Builders of a Great Land, p. 87. Sheila Heaney, married ____ Phillips, of Regina, and had three children. Kay Frances Heaney, married ____ VanDeSype, of Radville, and had four children. John Leo Heaney, born 4 December 1904, died aged less than one year, from influenza, and buried in the Heaney plot in the St. Ignatius Cemetery, Sault Ste. Marie. Kathleen Theresa Heaney (called Catherine in her birth record), born 14 January 1906, living 1980. According to information supplied by her brother Ambrose in Builders of a Great Land, “Kathleen commenced working in MacDonald’s store in 1929. In 1931 she began training at the Grey Nuns’ Hospital in Regina, graduating in 1934, and worked at Gravelbourg, Bengough, and Tisdale, returning to Ceylon in 1941. She married Timothy Curran in December 1941, and after his death in 1965, she worked at the Marian Home in Radville until her retirement in 1971. She resides in the original Heaney home on Main Street in Ceylon.” From the separate, very brief, sketch of her husband in the same volume, it seems clear that they had no children. Her husband, Timothy Curran, was brought by his parents from co. Kerry, Ireland, in 1904, and they settled at Indian Lake, Saskatchewan. After serving in World War I, he came to Regina in 1920 and to Ceylon in 1931, where in 1950 he bought the hardware store, which he ran until his death in March of 1965. John (“Jack”) Francis Heaney, born 8 March 1908 (per Deborah MacDonald; no registration found), living 1980. According to information supplied by his brother Ambrose in Builders of a Great Land, “Jack started working for the Bank of Montreal in 1923, and in 1929 returned to Ceylon to work for his brother in the municipal office. In 1935 he became Secretary Treasurer of the Rural Municipality of Oxbow. In 1939 he moved to Radville as Secretary-Treasurer of [the] R.M. of Laurier #38. He was with the Armed Forced for four years, returning from overseas in 1945. Later on he worked for the Federal Government, Revenue Branch, and remained until his retirement in 1971. He and his wife Muriel now  reside in Victoria, B.C.” No children are mentioned. Annie Catherine Rooney, born 20 February 1911. John James Bartley Rooney, born 19 October 1912, died 24 November 1917. Elizabeth Rose Rooney, born 12 August 1914, died 1994. Lawrence Francis Rooney, born in Decemmber 1916. Clare Ellen Rooney, born 11 August 1918, died 19 March 2008. Teresa Gertrude Rooney, born 21 November 1920, died 7 August 2010. She married Royce Lester Cudmore, and had issue. Christopher Francis (“Frank”) Heaney, born 16 July 1880, died unmarried in 1972 at Sault Ste. Marie. Anne Heaney, born 25 June 1882, died 1974 at Sault Ste. Marie. She married Edward Schaefer. James Heaney, born 14 July 1886 (per. 1901 census) at Mount Forest, died 15 April 1922 at Sault Ste. Marie. Joseph Gerard Heaney, born 1931, died 2000. Joseph Frederick Healey, married Marion ____; they assisted in the preparation of these notes. Elizabeth Margaret Heaney, born 17 November 1890, died in 1975 at Sault Ste. Marie. She married Joseph Eli Theriault. George Eugene Heaney, born 12 December 1891, died in infancy. Ambrose Heaney, born 14 May 1895 (per 1901 census), died in 1964 at Sault Ste. Marie. He married Rose ____, and they were the grandparents of Deborah MacDonald. James Heaney, born 11 September 1872 at Mount Forest (place per marriage record), died by 1950 (he predeceased his brother Owen). As James “Haney” he married 3 April 1894 at Guelph, by Roman Catholic rites, Martha Agnes Murnahan, born 1872-73 (aged 21 in 1894) in Erin Tp., died 17 November 1924, of pleurisy, aged 51 years, 9 months, 20 days, and buried 2 days following in the Roman Catholic Cemetery, Hespeler, daughter of James Murnahan (born in Ireland) and Ann Clarke (born in England). 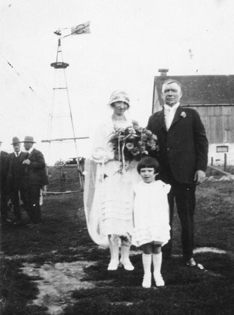 At the time of their marriage, the record of which names both sets of parents, the groom was a farmer, of Mount Forest, and the bride was of Guelph Tp; the witnesses were Timothy Scanlon, of Guelph, and Ellen Murnahan, of Erin Tp. According to Tom Synnott, the Murnahans “farmed a few concessions back of the Farrell farm in Erin Township and attended the same church of St. Peters in Oustic, which is in Eramasa Twp. Mother thought this is how James [Farrell] met Annie Heaney.” In the record of Martha Heaney’s death, which was reported by her sister Nellie Murnahan, her address is given as lot 11, F Concession 2, Puslinch Tp. Mary Heaney, born 30 April 1876 at Mount Forest, died 10 February 1915. She married 10 February 1915 at Hespeler, Waterloo Co., Ontario, the much younger William Harry Bowman, born 23 May 1888, at Morriston, Puslinch Tp., Wellington Co., Ontario, baptized in Freelton Catholic Church, died 18 September 1978, apparently at Guelph, Ontario, son of Anthony Bowman and Teresa Obrecht. At the time of their marriage, the record of which names both sets of parents, the groom was a farmer, of Puslinch, and the bride of Hespeler; the witnesses were Oscar (? entry very illegible) Bowman and Florence Bowman, both of Morriston, in Puslinch Tp. They afterwards moved to Spy Hill, near Esterhazy, Saskatchewan, and are mentioned as of there in the death notice of her sister Elizabeth. The community was greatly shocked to hear of the sudden passing of Mr. Owen Heaney on September 24. He had been ailing for some time but was able to be up and around until Saturday, when he took seriously ill and was taken to the Louise Marshall Hospital, where he quietly passed away on Sunday. He was a life-long resident of the Orchardville community and was highly esteemed by all who knew him. He had a kind and happy disposition and was willing to give a helping hand for all those in need of it. Left to mourn his loss are his two sisters, Elizabeth, who lived with him until his death, and Julia, Mrs. A. Farrell, of Streetsville, and a brother, Pat, who lived on the old homestead. A sister, Mary (Mrs. Bowman), and a brother, James, predeceased him some time ago. The funeral was held on September 27 from the Shuett Funeral Chapel to St. Mary’s Church for Requiem High Mass, sung by Rev. Father Doyle. Interment took place in Chapel Hill Cemetery, Orchardville, Rev. Father O’Brien officated at the grave. The pallbearers were his cousins, William Woods, Lawrence Kelley [these first two probably maternal cousins], Elwood Taylor, William Heaney, Leo Heaney, Joseph Heaney, [and] Frank Heaney. The funeral was largely attended by friends and relatives from Brantford, Hespeler, Guelph, and Streetsville. Elizabeth Heaney, born 14 March 1880, died by 1885, when another daughter was given the same name. Following her brother’s death twelve years ago she moved to Mount Forest. She was a devout member of St. Mary’s Church and of the Catholic Women’s League…. The pallbearers were Messrs. James Heaney, Frank Heaney, Joseph Heaney, Bernard Kelly, John Dickson and Arthur Kirby. The large attendance of relatives and friends at the funeral as well as the numerous mass cards testified to the esteem in which Miss Heaney was held. Friends and relatives attended from Brantford, Hespeler, Preston, Guelph, Wiarton, Owen Sound and Buffalo. (position uncertain) Patrick Heaney. He was still alive at the death of his brother Owen in 1950, but is mentioned as of Orchardville, deceased, in the 1967 death notice of his sister Elizabeth. Mary Lorraine Farrell, born 4 April 1921 in Erin Township, died 17 April 1934, of a ruptured appendix, at Streetsville. The death of Mrs. James Heaney occurred suddenly at her home in Egremont Township on Friday, September 31. Mrs. Heaney was the former Mary Cathrine Golden, a daughter of the late William Golden and Ellen Rooney, and was born in Normany Twosnhip. Fifty years ago she was married to James J. Heaney, who predeceased her in 1941. Left to mourn the loss of a loving mother are two daughters and five sons: Nellie (Mrs. denis Farrell) and Agnes (Mrs. Joseph Farrell), both of Guelph; James, Streetsville; William, at home; Leo, Georgetown; Joseph, Mount Forest, and Ambrose, Cooksville. Also surviving are one sister, Mrs. Nellie Foley, Neustadt, and one brother, Daniel Golden, Chicago, Ill. She was predeceased by one daughter, Catherine. The funeral service was held from St. Mary’s Church, Mount Forest, on Monday, September 24. Requiem Mass was sung by the Rev. Father J. Higgins, of Durham, who also conducted the service at Chapel Hill Cemetery. The pallbearers were three grandsons, Vincent Farrell, William Farrell, Leonard Farrell, and Gerald Beitz, Frank Heaney, and Fred Stortz. The many mass cards and flowers were a silent tribute to the esteem in which the deceased was held. Vincent Farrell, born 18 October 1929, died 13 July 1965. Francis (“Frank,” also known as “Red”) Farrell, born 28 April 1933, died 22 May 1999. He had six children: Debbie, born 17 January 1955; Brenda, born 21 March 1957; Heather, born 15 October 1959; Darwin, born 1 October 1960; Doug, born 20 July 1963; and Angel, born 20 June 1970. Charles (“Charlie”) Eldon Farrell, born in September 1936, died in March 1937, and buried in the “St. John’s section,” Holy Cross Cemetery, Mount Forest, where his tombstone calls him Eldon (a name which, according to his sister Marlene, he did not ordinarily use). William (“Bill”) Farrell, born 21 February 1939. He has two children: Connie, born 31 December 1966; and Kevin, born 17 May 1970. Earl (Bud) Farrell, born 8 April 1941. He has two children: Shawn, born 17 March 1975; and Eldon, born 20 June 1976. Robyn Heaney Doyle, born 17 July 1962, married her distant cousin, David Heaney. They have two children: Dylan Heaney, born 23 July 1987; and Desiree Heaney, born 6 March 1991. Shannon Doyle, born 15 November 1968. Ryan Doyle, born 4 May 1977. Scott Murray; unmarried as of March 2008. Wendy Lynne Murray; married 5 October 1996, Elden Pinheiro. They have three children: Sydney Lynne, born 5 July 1997; Devon Jacob, born 29 June 2000; and Jordan Mitchell, born 16 April 2002. Agnes Mary (or Mary Agnes) Heaney, born 16 April 1907. She married Joseph Farrell, of Arthur Tp. in 1941 but of Guelph in 1956. Catherine Heaney, born 6 February 1912, died 27 December 1929, and buried with her parents. William Heaney, also buried in the “St. John’s section,” Holy Cross Cemetery, Mount Forest, in the same plot as his nephew, Eldon Farrell. He was living with his mother at the time of her death in 1956. Leo Francis Heaney, married 20 April 1944 in St. Peter’s Church, Ayton, Ontario, Anna Marie, daughter of the late Xavier Lobsinger. Their marriage announcement states that “the bride and groom will reside on No. 6 Highway near Mount Forest.” His residence is stated as Malton, Ontario, in 1941, but as Georgetown in 1956. Joseph Heaney, of Malton, Ontario, in 1941 and of Mount Forest in 1956. He is described as “Joseph Heaney, son of Mrs. James Heaney and the late Mr. Heaney of Mount Forest,” in a newspaper annoucement of his marriage, on 21 February 1943 at St. Mary’s Roman Catholic Church, Formosa, Ontario, to Gertrude Keip, daughter of George Keip. The annoucement states that the couple would reside at Toronto. Ambrose Heaney, living with his parents in 1929, but of Malton, Ontario, in 1941, and of Cooksville in 1956. 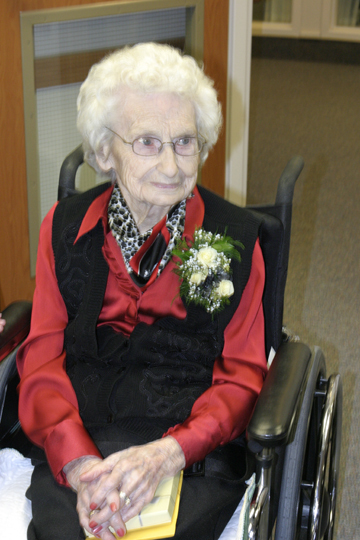 Nellie (Heaney) Farrell Wishart on her 100th birthday, 7 January 2005. Courtesy of her daughter, Marlene (Farrell) Doyle. 1. R. Gibney, Irish-born Gibneys documented as of April 24, 1999, available online at http://web.archive.org/web/20021212123756/ http://us.share.geocities.com/Heartland/Cottage/1358/irishbirths/ irish001.html (warning: the file is 1.6 megabytes! ), points out that John and Ann [Heaney] Gibney, the latter said to have been from the parish of Oldcastle, co. Meath, Ireland, had a daughter Jane who is enumerated in the 1871 census of Normanby, District 36, Subdistrict A, Division 3, p. 22. Jan Ehresmann informs us that the O’Briens are found in the 1852 census of Normanby. 2. See The Cody Chronicles, available online at http://www.genealogy.com/genealogy/users/c/o/d/Cliff-Cody/? Welcome=1020910401. 3. Patricia Greber, “The Stewart Puzzle,” Heritage Seekers (Grande Prairie & District Branch Alberta Genealogical Society), vol. 24, no. 4 (December 2001), available online at http://www.rootsweb.com/~abgpags/hs1201.html. 4. Harvest of Memories, p. 820 (which mentions other families from Manannah in the Sturgis area), 185 (naming early Catholic families in the Sturgis area). This two acre plot was used for burials of early Catholic settlers from Durham, Ayton, and Mount Forest until each of these parishes obtained is own burial ground. This cemetery is also known as “Union Cemetery” and “Chapel Hill.” The earliest burial that was recorded was that of Edward McIntee in 1840. The large white cross was installed by William J. Smith and his twin brother John. The cemetery was closed in 1969. 6. Bob McIntee (transcriber), Holy Cross [Roman Catholic] Cemetery, Mount Forest, Archives of Ontario Cemetery Records Collection, series 10, MS 451, reel 74. 7. Unfortunately his Gibney One Name Searchable Database, formerly available at http://worldconnect.genealogy.rootsweb.com/cgi-bin/igm.cgi? op=GET&db=gibney1, is no longer in existence. 8. He is treated in Martin Bootsman, Wellington County & Beyond — A Community Connection Tree, available online at http://worldconnect.genealogy.rootsweb.com/cgi-bin/igm.cgi?db=tincanman. This database treats mainly the children Jane and James. 9. He was said to be aged “54 at next birthday” in 1852, and his tombstone states that he was aged 70 years at his death in 1870. 10. This information is from his tombstone; his death appears to have gone unregistered. 11. Grey County death registrations, no. 005530. 12. Personal Census Returns of Canada West [Ontario], 1851-52, RG 31, reel C-11723, township 93, p. 17. 13. “Ratepayers in 1864,” in Arthur Walker Wright, Memories of Mount Forest and surrounding townships, Minto, Arthur, West Luther, Normanby, Egremont, Proton, in honor of the Diamond Jubilee of the Confederation of the Dominion of Canada and of the founding of The Mount Forest Confederate, 1867-1927 (1927? ), pp. 164-68, at p. 166. 14. Gazetteer and Directory of the County of Grey for 1865-6, by W.W. Smith (Toronto, 1865), cited above. 15. Information from the present owner of the property; for further details see the account of James Healey below. 16. 1871 census of Canada, Ontario, District 36 (Grey South), subdistrict A (Normanby), Division 3, p. 22, PAC microfilm C-9950; 1881 census of Canada, Ontario, District 154 (Grey South), subdistrict C, Division 1, p. 21, PAC microfilm C-13260. 17. Such a date is in agreement with her age of 22 years as reported in the 1852 census, and of 41 years as reported in the 1871 census; and the 1852 census specifically gives the month of her birth as August. 18. His age is reported quite inconsistently, being given as 27 in the 1852 census, 51 in the 1871 census, and his tombstone giving his date of birth as 1824. 19. 1852 Census of Canada West, township no. 93 (Normanby), p. 19; PAC microfilm no. C11723 [FHL microfilm no. 349,208]. 20. Gazetteer and Directory of the County of Grey for 1865-6, by W.W. Smith (Toronto, 1865), cited above. 21. 1871 census of Canada, Ontario, District 36 (Grey South), subdistrict A (Normanby), Division 3, p. 61, PAC microfilm C-9950. 22. 1881 census of Canada, Ontario, District 154 (Grey South), subdistrict C, Division 1, p. 8, PAC microfilm C-13260. 23. 1901 Census of Ontario, district 66 Grey South), subdistrict G (Normanby), division 6, p. 10. 24. Normanby Reflections: A History of Normanby Township, ed. Campbell Cork (Normanby History Committee, 1989), 506. 25. Wellington County marriage registrations, no. ________, from a transcription. 27. Grey County marriage registrations, no. 4183-91. 28. Grey County marriage registrations, no. 1901-1904901. 29. Katherine McElhone, Lynett_Regan_Connolly_McElhone, at https://www.myheritage.com/pedigree-tree-125715281-1001802/lynett?treeId=1#:f.
30. Wellington County marriage registrations, no. 1883-012871. 31. 1901 census of Canada, Ontario, district 66 (Grey South), subdistrict G (Normanby), division 5, p. 5. Entire family is Roman Catholic. 32. Grey County marriage registrations, no. 4187-91. 33. Ontario Marriage Index, 1869-1886, which shows no surname for his wife. We tentatively supply her surname from the local history. 34. 1901 Census of Ontario, district 66 Grey South), subdistrict G (Normanby), division 6, pp. 9-10. 35. Gray County marriage registrations, no. 1903-008664. 36. Wellington County marriage registrations, no. 1881-011950. 37. Grey County marriage registrations, no. 4042-87. 38. 1901 census of Ontario, District 66 (Grey South), subdistrict d (Egremont), division 3, p. 10; PAC microfilm no. T-6470. 39. Such a date would be compatible with her age of “20 at next birthday” as given in the 1852 census, and of 29 as given in that of 1870. It does not however quite agree with the age of 22 years given in her marriage record. 40. Saskatchewan Cemeteries Project: St. Patrick’s Roman Catholic Cemetery, Sturgis, at http://www.rootsweb.ancestry.com/~cansacem/sturgis_st_patricks.htm. 41. Grey County marriage registrations, Archives of Ontario microfilm no. 1030056, per County Marriage Registers of Ontario, Canada, 1858-1869, ed. Elizabeth Hancocks, vol. 33 — Grey County (Agincourt, Ontario: Generation Press, n.d.) p. 95. This record is in good agreement with the 1900 census, which states they had been married 35 years. The statement in Harvest of Memories, that they “married and immigrated to Ontario” is misleading, as Patrick had already been living in Ontario as an 11-year-old child. 42. Harvest of Memories, p. 664. This date is exact agreement with the age of “12 at next birthday — March” reported for him in the 1852 census, and in pretty good agreement with that of 25 years in his marriage record, and that of 30 years in the 1870 census. 43. Harvest of Memories says Dublin at p. 622, but co. Cork at p. 664. 44. The series County Marriage Registers of Ontario, Canada, 1858-1869, ed. Hancocks, transcribes the name as McEnter, while Ontario, 1858-1869 Marriage Index (Family Tree Maker CD no. 266) gives it as McEasten. We have not checked the original record. For further discussion of this point see our REAGAN notes. 46. 1870 census transcription of Meeker County, Minnesota, transcribed by Erma Diane Rosenow, available online at http://www.rootsweb.com/~usgenweb/mn/meeker/meeker.html. 47. 1875 census transcription of the townships of Dassel, Kingston, Litchfield, Manannah, Swede Grove, and Union Grove, Meeker County, Minnesota, transcribed by Erma Diane Rosenow, available online at http://www.rootsweb.com/~usgenweb/mn/meeker/meeker.html. 48. 1880 U.S. Federal census, Minnesota, Meeker Co., Manannah Tp., Ennumeration District no. 50, Supervisor’s District no. 2, p. 6. 49. 1900 U.S. Federal census, Minnesota, Meeker Co., Manannah Tp., Supervisor’s District no. 3, Enumeration District no. 106, sheet 5. 50. Bureau Of Land Management - General Land Office Records, accession no. MN1910__.209. 51. Michael Nistler, The Valley of Eden (1986), from an extract kindly sent by Jan Ehresmann. 52. “Scandinavian Canadian Land Co. Historic Map,” available online as part of the Kamsack, Saskatchewan, GenWeb Project, at http://www.rootsweb.com/~skkamsac/map/Tsp34-Rge4.gif. The date of the map is there given as ca. 1905, but this date is evidently too early. 53. This man is listed as a farm-laborer in the 1900 census of Manannah Tp., his birthdate being given as 1880, his birthplace as Canada, the birthplaces of both parents as Ireland, and the year of his attaining U.S. citizenship as 1895; see 1900 U.S. Federal census, Minnesota, Meeker Co., Manannah Tp., Ennumeration District no. 106, Supervisor’s District no. 3, sheets 6A, 7A (probably same man, duplicate entries). We have not found a plausible candidate for him in the L.D.S. index to the 1881 Canadian census, even allowing for some latitude in the date of his birth. In Harvest of Memories, p. 408, it is stated, “He obtained entry to his homestead in August 1904. He was single, 27 years old (suggesting a birthdate of 1876-77), and had been born a British subject. He may have been a relation to Patrick (Paddy) Reagan, Senior, and his wife Catherine Heaney. He probably left Saskatchewan before fifteen years had passed because in 1917 a map shows that his land was owned by Mosken.” He is listed at section 28, in township 34, range 4 of the second meridian west of the Principal Meridian, in the 1906 census, which gives his age as 28 (suggesting a birthdate of 1877-78) and his marital status as single; see Census of the Northwest Provinces [of Canada], 1906, Province: Saskatchewan, District 14 (Mackenzie), Subdistrict 27, p. , PAC R.G. 31 [microfilm no. T-18359]. 54. He was aged “10 at next birthday [in] May” in 1852, aged 22 at his marriage in 1866, and aged 32 in 1875. A published transcription of his tombstone gives his birthdate (possibly by calculation) as 1841. 55. This is the date given on his tombstone, and is compatible with the age of 29 years reported in his 1858 marriage record, of 40 years reported for him in the 1871 census, and of 86 years, 9 months at his death, but not with the age of 25 years reported for him in the 1861 census; the date of 12 August 1834 given for him in the 1901 census is probably erroneous. 56. Ontario death registrations, Grey County, Normanby Township; see below for a discussion of the erroneous information it supplies concerning his parentage. 57. Information from the present owner of the property. 58. Grey County marriage registrations, Archives of Ontario microfilm no. 1030056. 59. The date is also given as 1835 on her tombstone; however her age was reported as 21 on her marriage in 1858, as 22 in the 1861 census, and (apparently) as 34 in the 1871 census. 60. Grey County death registrations, no. 013550. 61. Her father is named both in her marriage record and in her death record; the first name of her mother is given in her marriage record (which only asked for the mother’s given name), and the second name in her death record (which only asked for the mother’s maiden surname, not her full name). The only Oliver O’Hara found in the 1852 census of Egremont Tp. (Township 88, p. 3) was aged only 33 years at the time, and is not likely to have been her father. 62. 1861 census of Canada, Ontario, Grey Co., Normanby Tp., District 3, p. 26, PAC microfilm no. C-1027. 63. “Ratepayers in 1864,” in Arthur Walker Wright, Memories of Mount Forest and surrounding townships… (1927? ), pp. 164-68, at p. 166. 64. Gazetteer and Directory of the County of Grey for 1865-6, by W.W. Smith (Toronto, 1865), cited above. 65. Joe Heaney, “Heaney,” in Normanby Reflections, cited above, p. 379. 66. 1871 census of Canada, Ontario, District 36 (Grey South), subdistrict A (Normanby), Division 2, p. 44, PAC microfilm C-9950. 67. 1881 census of Canada, Ontario, District 154 (Grey South), subdistrict C, Division 1, p. 18, PAC microfilm C-13260. 68. 1901 census of Ontario, District 66 (Grey South), subdistrict g (Normanby), division 6, p. 1.
name    gender relat.cond. birthdate age b.p. immig. nation. occ. 70. The birthdate of 14 November 1868 and age of 32 given for her in 1901 is not credible, and the birthdate of November 1873 and age of 39 years in 1911 even less so. 71. Per his baptismal record. According to the 1901 census and his death notice he was born 16 February 1868, but just because these sources agree does not make them correct. His tombstone gives the date 1867, but the ages of 6 years (in 1871) and 15 years (in 1881) stated for him in census records imply that he was born in 1864-66. In our opinion, the earliest records are more likely to be correct. 72. Clearly the statements in his death record that he was born in August 1870, and in his death announcement that he ws born in 1870, are incorrect. 73. Grey County death registrations, no. 17428; the record names his parents as James Heaney and Agnes O’Hara. 74. Per his death notice, quoted below. 75. Ontario marriage registrations, no. 019563: reference from index; original record not yet checked. 76. Mary Ann Hagen, McEllistrum Family, available online at http://worldconnect.genealogy.rootsweb.com/cgi-bin/igm.cgi?db=mam. 77. Wellington County marriage registrations, 1898, unnumbered. 78. “Bridget wife of Hugh Keais, aged 50 years” is buried in Chapel Hill Cemetery, but her tombstone gives no dates. 79. And not in November 1877 as stated in the 1911 census. 80. Harvest of Memories: Sturgis and District …, 1900-2000 (spine title: A Century of Memories), by the Sturgis and District History Book Committee (Sturgis, Saskatchewan: the Committee, 2000), pp. 374, 622, implies that she was a sister of Catherine (Heaney) Reagan, a claim which we feel is amply borne out on onomastic grounds. Much of out information on her is taken from a well-documented web page by R. Gibney, Irish-born Gibneys documented as of April 24, 1999, available online at http://web.archive.org/web/20021212123756/ http://us.share.geocities.com/Heartland/Cottage/1358/irishbirths/ irish001.html (warning: the file is 1.6 megabytes! ), where however the presentation somewhat confusingly makes it seem that she, rather than her husband, was the head of their family. We have also taken some material from the valuable database on this family by Reuben L. Gibney, Descendants of Bryan Gibney, at http://www.familyorigins.com/users/g/i/b/Reuben-L-Gibney-CA/FAMO1-0001/index.htm. 81. 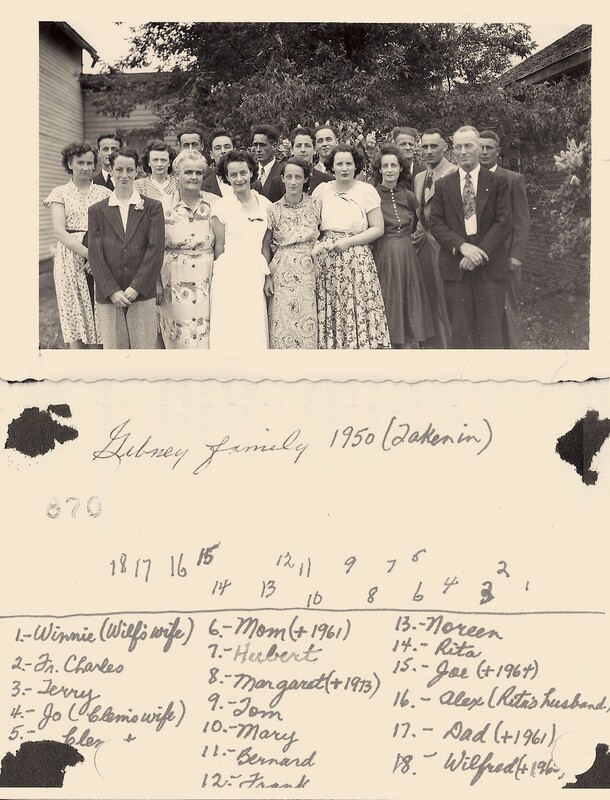 Per the valuable database on this family by Reuben L. Gibney, Descendants of Bryan Gibney, at http://www.familyorigins.com/users/g/i/b/Reuben-L-Gibney-CA/FAMO1-0001/index.htm. 82. Reuben L. Gibney, Descendants of Bryan Gibney, at http://www.familyorigins.com/users/g/i/b/Reuben-L-Gibney-CA/FAMO1-0001/index.htm. 83. 1861 census of Canada, Ontario, Grey Co., Normanby Tp., District 2, p. 17, PAC microfilm no. C-1027. 84. Gazetteer and Directory of the County of Grey for 1865-6, by W.W. Smith (Toronto, 1865), cited above. 86. Reuben L. Gibney, Descendants of Bryan Gibney, at http://www.familyorigins.com/users/g/i/b/Reuben-L-Gibney-CA/FAMO1-0001/index.htm (page could not be accessed 3 November 2017). 87. 1880 census of Manannah Tp., Meeker Co., Minnesota, Ennumeration District no. 50, Supervisor’s District no. 2, p. 5. 88. The story is quoted in Minnesota Pamphlet for Settlers, 1878, p. 14; we have not seen the original item. 89. Album of history and biography of Meeker County, Minnesota (Chicago, 1888), 246-47. In the listing of the children, the son James seems to be out of order. 90. 1880 census of Manannah Tp., Meeker Co., Minnesota, Ennumeration District no. 50, Supervisor’s District no. 2, p. 6. 91. See further in Harvest of Memories, pp. 374-76. 92. 1900 U.S. Federal Census, North Dakota, Ramsey Co., Dry Lake, enumeration district 124, p. 11A; roll T623 1231. 93. Album of history and biography of Meeker County, Minnesota (Chicago, 1888), 398. 94. Harvest of Memories, p. 622. 95. Census of the Northwest Provinces [of Canada], 1906, Province: Saskatchewan, District 14 (Mackenzie), Subdistrict 27, p. “25” [sic, but clearly out of sequence], PAC R.G. 31 [microfilm no. T-18359]. 97. His affiliation with St. Gerard’s Roman Catholic Church, Yorkton, is mentioned in Laurie Hluchaniuk &, York Colony Research [Association], Yorkton: York Colony to Treasure Chest City (Yorkton, Saskatchewan: Yorkton Centennial Committee, 1982), p. 73. 99. According to the online index to Minnesota marriages at https://www.moms.mn.gov/. 100. Such as Nick Babineau, Babineau Family Tree, at https://www.ancestry.com/family-tree/person/tree/156462416/person/362070321276/facts?_phsrc=oLx65&_phstart=successSource. The existence of the couple Patrick FitzPatrick (1802-1875) and Mary Malone (1809-1861) does not seem to be in any doubt, but it is not now known on what basis our John FitzPatrick is claimed to be their son. Possibly John’s marriage record would through light on the question. 101. For accounts of him and his wife see Saskatchewan Cemeteries Project, Obituaries of people who are buried in the St. Patrick's Roman Catholic Cemetery, Sturgis, at http://www.rootsweb.ancestry.com/~cansacem/st_patrick_obits.html. 103. 1900 U.S. Federal census, Minnesota, Meeker Co., Manannah Tp., Supervisor’s District no. 3, Enumeration District no. 106, sheet 2B - sheet 3A. 104. 1910 U.S. Federal census, Minnesota, Meeker Co., Manannah Tp., Supervisor’s District 6, Enumeration District no. 96, sheet 6B. 105. 1920 U.S. Federal Census, Minnesota, Meeker Co., Manannah Tp., enumeration district 119, p. 7B; roll T625_845. 106. Compendium of History and Biography of Central and Northern Minnesota (Chicago, George A. Ogle & Co., 1904), p. 815. We are deeply grateful to Tim Stowell for putting this online at his Compendium of History and Biography of Central and Northern Minnesota site, at http://www.rootsweb.com/~mnwilkin/bios/book.htm. 107. Kurth, Ann, comp. Benton, Meeker, and Todd Counties, Minnesota Farm Directory, 1913-14 [database online] (Provo, Utah: Ancestry.com, 2000-), citing Minnesota Historical Society, Collection of Minnesota County Atlases, #175, Roll 8. 108. 1871 census of Canada, Ontario, District 36 (Grey South), subdistrict A (Normanby), Division 3, p. 22, PAC microfilm C-9950. 109. Information from Rocky Gibney. 110. O’Neill Family Tree, at http://trees.ancestry.com/pt/pedigree.aspx?tid=9728445. 111. O’Neill Family Tree, at http://trees.ancestry.com/pt/pedigree.aspx?tid=9728445. 112. Silvernail Family Tree, at http://trees.ancestry.com/pt/pedigree.aspx?tid=24412826. 113. IGI batch no. M39691-2; FHL microfilm no. 1,380,436. 114. 1900 U.S. Federal Census, North Dakota, McHenry Co., Towner, enumeration district 92, p. 1A; roll T623 1229. 115. 1920 U.S. Federal Census, New Mexico, Grant Co., Fort Bayard, enumeration district 47, sheet 9B; roll T625_1076. 116. 1930 U.S. Federal Census, New Mexico, Grant Co., Precinct no. 1, Central, enumeration district 1, p. 9B; roll 1395. 117. The deathdate of Jan. 1927 given for him in the webpage of R. Gibney is therefore erroneous. 118. Social Security Death Index. 119. 1920 U.S. Federal Census, Washington (State), Skagit Co., Mount Vernon, enumeration district 103, sheet 9A; roll T625_1935. 120. 1930 U.S. Federal Census, New Mexico, Grant Co., Precinct no. 1, Central, enumeration district 1, p. 9B; roll 1395. 122. Grey County death registrations, no. 013957, which explicitly names his parents as Owen Heaney and Mary Smith. 123. St. Peter’s Roman Catholic Cemetery, Part Lot 15, Concession 9 Normanby Township, Grey County (Owen Sound, Ontario: Bruce & Grey Branch, Ontario Genealogical Society, n.d.), available online at https://brucegrey.ogs.on.ca/wp-content/uploads/2016/11/ St.-Peters-Roman-Catholic-Cemetery-Normanby-Township-Grey-County.pdf. 124. Gazetteer and Directory of the County of Grey for 1865-6, by W.W. Smith (Toronto, 1865), cited above. 125. Information from Fred and Marion Heaney. 126. Her birthdate is given as 26 May 1840 in the 1901 census, which is compatible with her age of 40 years in the 1881 census; but her age is given as only 29 years in the 1871 census (implying a birthdate of 1841-42), and her birthdate is given as 20 November 1838 in her death record. Her tombstone states her age at death as 73 years. 127. Grey County death registrations, no. 013537. 128. John Hanrahan (ca. 1797-1869) and his wife Mary O’Brien (ca. 1804-1865) came from Ireland (he was born in co. Tipperary) to Normanby Tp., Grey Co., according to the researches of Patrick Hanrahan, of Portland, Oregon, author of Hanrahan Family History (Portland, 1983). 129. “Ratepayers in 1864,” in Arthur Walker Wright, Memories of Mount Forest and surrounding townships… (1927? ), pp. 164-68, at p. 166. 130. 1871 census of Canada, Ontario, District 36 (Grey South), subdistrict A (Normanby), Division 2, p. 43, PAC microfilm C-9950. 131. 1881 census of Canada, Ontario, District 154 (Grey South), subdistrict C, Division 1, p. 18, PAC microfilm C-13260. 132. 1901 Census of Canada, Ontario, district 66 (Grey South), subdistrict G (Normanby), division 2, p. 10; PAC microfilm no. T-6470. 133. The birthdate of 7 April 1873 attributed to her in the 1901 census is completely erroneous. 134. A published transcript reads the date as 1887, which would make John Smith some 21 years younger than his wife. 135. Grey County marriage registrations, no. 4750-96. 136. Thomas Corcoran, of Arthur Tp., aged 24, born in Ireland, son of Thomas and Anne Corcoran, married 14 October 1867 in Wellington Co. (County marriage register, Archives of Ontario microfilm no. 1030067), Elisabeth McCann, of Minto Tp., Wellington Co., aged 20, born in Ireland [the 1881 census says she was born in Ontario], daughter of Thomas McCann and Cath. Campbell. They are shown as Thomas Corcoran (1840-1921) and Elizabeth Corcoran (1848-1921) on their tombstones in the “St. Mary’s section” of Holy Cross Roman Catholic Cemetery, Mount Forest. 137. 1881 Census of Canada, district 153 (Wellington North), subdistrict F (Arthur Tp. ), division 1, p. 22; PAC microfilm no. C-13260 [Family History Library microfilm no. 1,375,896]. 138. Polk’s Detroit (Michigan) City Directory, vol. 66 (1928-29), p. 702.
name      relationship  gender age cond. birthpl. father's b.p. mother's b.p. Joseph M. Corcoran* head  M   59   M   Can. Eng. Ireland Free State  Can. Eng. Mary A. Corcoran*   wife  F   57   M   Can. Eng. Can. Eng. Can. Eng. 140. Ontario civil birth registrations, MS929_140. 141. Ontario civil birth registrations, MS929_146; birthplace named specifically as “Godrich&rquo; in marriage record. 142. Wentworth County marriage registrations, 1923, no. 024070. 143. Polk’s Detroit (Michigan) City Directory, vol. 66 (1928-29), p. 702. Thomas P. Corcoran*+  head  M  31      M   Can. Eng. Can. Eng. Can Eng. * His age at first marriage 23; hers 22. He a citizen in 1922; she in 1923. 145. Card Manifests (alphabetical) of individuals entering through the Port of Detroit, Michigan, 1906-1954, National Archives micropublication M1478, RG085, 117 rolls. Image available online at Ancestry.com. 146. Ontario civil birth registrations, MS929_156. 147. Ontario civil birth registrations, MS929_161. 148. Ontario civil birth registrations, MS933_45. 149. Grey County death registrations, no. 017439. 150. Grey County marriage registrations, no. 9214-05. 151. The birthdate of 20 June 1876 given in the 1901 census is clearly incorrect. 152. The birthdate of 17 March 1879 given for him in the 1901 census is clearly incorrect. 153. The birthdate of 20 June 1880 given for him in the 1901 census is clearly incorrect. 154. He was aged “10 at next birthday [in] May” in 1852, aged 22 at his marriage in 1866, and aged 32 in 1875. A published transcription of his tombstone gives his birthdate (possibly by calculation) as 1841. 155. “Ratepayers in 1864,” in Arthur Walker Wright, Memories of Mount Forest and surrounding townships… (1927? ), pp. 164-68, at p. 166. 156. Wellington County marriage registrations, Archives of Ontario microfilm no. 1030067. 157. Gazetteer and Directory of the County of Grey for 1865-6, by W.W. Smith (Toronto, 1865), cited above. 158. 1870 U.S. Federal Census, Minnesota, Meeker Co., Mannanah Tp., pp. 6, 7. 159. Bureau Of Land Management — General Land Office Records, accession no. MN1930__.023. 160. 1880 U.S. Federal census, Minnesota, Meeker Co., Manannah Tp., Supervisor’s District 2, Enumeration District no. 50, p. 9. 161. 1910 U.S. Federal census, Minnesota, Meeker Co., Manannah Tp., Supervisor’s District 6, Enumeration District no. 96, sheet 3B. 162. We take her maiden surname from the entries for her sons Patrick and Thomas in the Social Security Death Index. had Irish-born fathers and mothers. 164. 1930 United States Federal Census, Minnesota, District 47 (Meeker Co.), Enumeration District no. 21, p. 5B, microfilm reel T626_1106. 165. Her tombstone gives the dates 1911-1977. We take the exact dates, and her place of “last residence,” from the Social Security Death Index. 166. Anaconda Standard, 20 January 1917, from McCusker and branches Family Tree - 2014. 167. a much fuller account of this family will be found in McCusker and branches Family Tree - 2014, from which we have taken a few details. 168. Minnesota marriage index; original record not checked. 169. 1890 Federal census of Minnesota, Meeker Co., Manannah Tp., sheet 7A. 170. Social Security Death Index, giving the maiden name of his mother as Burns. 171. Social Security Death Index, giving the maiden name of his mother as Burns. 172. The 1901 census that he was born 10 November 1851 in Ireland but came to Canada in 1845! Thus it is clearly warrants no credence as an indication of his date of birth, and the immigration date of 1845 seems impossible in light of the date contained in the entry for his parents’ family in the 1852 census. 173. Algoma District death registrations, 1917, no. 007568, which specificaly names his parents as Owen Heaney and Mary Smith. This proves that the age of 56 years given in his burial record is wildly erroneous. 174. Ontario French Catholic Church Records (Drouin Collection), 1747-1967, images of original records at Ancestry.com. The age at death of 56 years given in this record is impossible. 175. 1871 census of Canada, Ontario, District 36 (Grey South), subdistrict A (Normanby), Division 3, p. 22, PAC microfilm C-9950. 176. 1881 census of Canada, Ontario, District 154 (Grey South), subdistrict C, Division 1, p. 21, PAC microfilm C-13260. 177. Information from Fred and Marion Heaney. name       gender relat. birthdate     age birthpl. immig. occ. 180. According to grandson Joseph Gerard Heaney. Much additional information on this family comes from a great-granddaughter, Deborah MacDonald. 181. The place is mentioned in the birth record of his daughter Evelyn, and the township is given in his own marriage record. 183. Per her death notice. 184. Per her death notice, which does not give the date of death. 185. Biographical sketches of four brothers appear in History Committee of R.M. of the Gap #39, Builders of a Great Land: History of the R.M. of the Gap #39, Ceylon and Hardy (Ceylon, Saskatchewan: The Committee, 1980), pp. 430-32. 186. Builders of a Great Land, pp. 85-87 (for Heaney). 187. In the delayed birth record of their daughter Eveyln, prepared 7 October 1947, it is stated that their mother had had two children up to and including Evelyn, and that they were both still alive at the time. 188. Algoma District birth registrations, 1902, unnumbered, in which the name is recorded as Oliver Ambrose Heaney. A duplicate, delayed registration numbered 007039 was made on 27 August 1917, giving the applicant’s address as Ceylon, Saskatchewan. 189. In Builders of a Great Land, p. 86, she is called “a niece of Joshua and Robert Kines,” indicating that her mother was one of the three unnamed daughters of James and Harriet (Montgomery) Kines, of Carberry, Manitoba, who are mentioned in the same work, pp. 80, 81. Her parents were married at Carberry on 23 January 1895, and the record of this marriage (Manitoba marriage registrations, no. 1895-001157) is our source for their names. Leah’s maternal grandfather, James Kines, evidently born in 1841-42, died 4 June 1900 at Carberry, aged 58 years (Manitoba death registrations, no. 1900-003565). 190. Algoma District birth registrations, no. 03073 (delayed, dated 1947). 191. Algoma District birth registrations, 1904, unnumbered. 192. Algoma District birth registrations, no. 010917. 193. Builders of a Great Land, pp. 105-6. 194. Our information on her is taken from a pedigree chart by her nephew, Joseph Gerard Heaney, and from the Cudmore Family Tree at https://www.ancestry.com/family-tree/tree/14585847/. 195. The date of 9 November 1891 given in the 1901 census is completely erroneous. 196. According to the pedigree chart by her nephew, Joseph Gerard Heaney. 197. His age is reported, inconsistently, as 18 years in 1871, 26 years in 1881, as 58 years in his death record in 1908, and as “58 years, 2 months, 4 days” on his tombstone. 198. Grey County death registrations, no. 012032. 199. Joe Heaney, “Heaney,” in Normanby Reflections, cited above, p. 379. Entire family’s religion is Catholic. 201. Information from Fred and Marion Heaney. 202. Her age is reported, inconsistently, as 24 years in 1881, but as 35 years at her death in 1890, per her tombstone. 203. See the account of her parents in Normanby Reflections, p. 503, where her mother is called Mary Dowling. She is called Mary Doolan in her daughter’s marriage record. 204. Wellington County marriage registrations, no. 1894-012930, an entry kindly brought to our attention by Tom Synnott. 206. Waterloo County marriage registrations, no. 1915-015500. This record appears to give the groom’s age as 20, and it has been so read by the indexers at Ancestry.com; however, this would appear to be imposible. 207. See The Bauman Family of Puslinch and area: Bauman and Fanny Steffler — Descendants of Anthony Bowman and Theresa Obrecht, anonymous, available online at http://freepages.genealogy.rootsweb.com/~puslinchbowman/ anthony_bowman.htm. This cites a death notice in the Guelph Daily Mercury of unstated date. name     gender relat. cond. birthdate age birthpl. occ. 209. Death notice, Mount Forest Confederate, 26 July 1967, collection of Thomas Synnott. 210. Date taken from 1901 census and place taken from marriage record; birth registration not found. 211. Peel County marriage registrations, no. 1920-021679, an entry kindly brought to our attention by Tom Synnott. 212. Information from Tom Synnott. 213. Information from Tom Synnott. 214. See the discussion under the account of his parents above. 215. Grey Coiunty marriage registrations, no. 6948-00. 216. 1901 census of Ontario, District 66 (Grey South), subdistrict d (Egremont), division 3, p. 10; PAC microfilm no. T-6470. 217. Death notices of James J. Heaney and his daughter Catherine Heaney; order partly inferential. 218. Information from his niece, Marlene (Farrell) Doyle. 219. Information mainly from Marlene (Farrell) Doyle. 220. Information from Wendy Lynne (Murray) Pinheiro. 221. Grey County death registrations, no. 016776. 222. Information from his niece, Marlene (Farrell) Doyle.